Alas, if only it were just to insult Catholics . . . ! It's the objective insults and disobedience to God and His Holy Laws that's the problem . 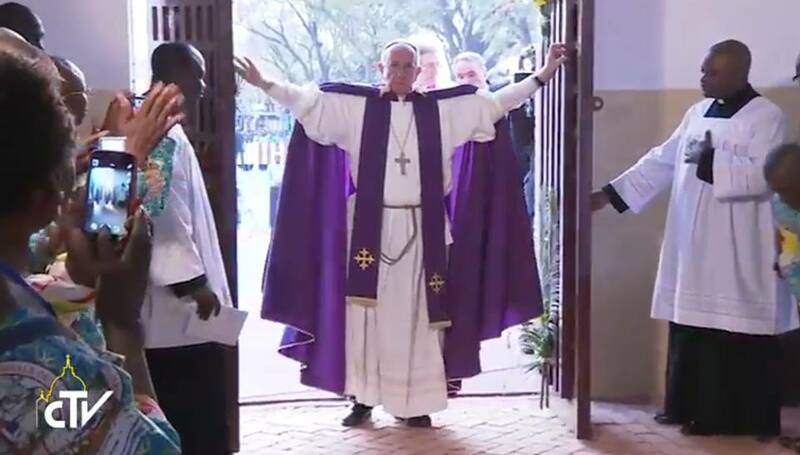 . .
And Gandalf in purple dressed said 'You can not pass' free entry, very Catholic people not allowed.....that's all fun. Shaun the sheep. And we are all together"
Bergog who serves up bad wine from a phony vineyard, is honoured because he is a pretender with 'the Jesus Christ pose'. Poser is the thing. Posers pull in a lot of confusion and give it 'comfort'. If only folks bothered to stop unlearning the faith. No one expects a Francis Inquisition!!! outstretched arms....on the cross.. if Jesus Christ had been that overweight, never mind I won't go there. Rorate has link to video clip where he gets a big applause and cheers and people fall to their knees while he remains standing. "Oh Lord, it's hard to be humble, when you're perfect in every way"
Franciscus is Generalissimo of the Church Militant and because he refuses to try and convert protestants and Messias Deniers, and because he refuses to fight the enemies of the One True Holy Roman Catholic and Apostolic Church, he must spiritually wound his own troops so he can have a steady supply of innocent victims to justify keeping his field hospital open. That should become Francis's theme song. We Africans needs this so much! The Holy Father came to risk his life and show the real side of human dignity. The reality is that other world leaders have fallen short in this respect. Because, there is so much political correctness in the so called Developed world. Europeans might joke a lot with plenty of double standards and political nonsense. But, in the heart of Africa there is a lot at stake and to have the visit of Sovereign Pontiff of the Catholic Church in these difficult times is a blessing from God almighty! You might joke about the Pope and try to distort the historical importance of his pontificate but blasphemy is easy to construct and Lucifer enjoys the empty rhetoric and attacks again. One day when we all will b ein purgatory, perhaps we will realise that we could have done more to advance the Kingdom of Jesus. God Bless you Pope Francis, Sovereign Pontiff of Rome for coming to Africa and remind the World of the meaning of Humanitarian values, the values of Christ!